Bayer and Johnson & Johnson have abandoned a 7,000-patient trial pitting their novel oral anticoagulant (NOAC) Xarelto against aspirin for ischaemic stroke after conceding it will not meet its objectives. 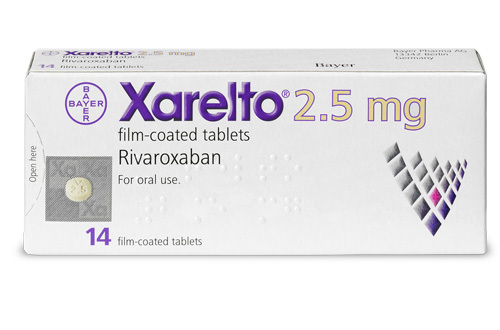 The large-scale NAVIGATOR ESUS trial was meant to show that Xarelto (rivaroxaban) was more effective at preventing a second stroke in patients with embolic stroke of undetermined source (ESUS) than low-dose aspirin, which is commonly prescribed for this purpose, but failed to hit the mark at the interim stage. Three years in, the trial’s data monitoring committee concluded that there was “comparable efficacy between the rivaroxaban and aspirin arms and very little chance of showing overall benefit if the study were completed”. The trial got underway in 2014 and was due to complete in January 2018. While bleeding rates were low overall, an increase in bleeding was observed in the rivaroxaban arm compared to the low dose aspirin arm, according to the two companies. The failure is a setback in an otherwise strong development programme for Xarelto, which has been approved since 2011 and brought in almost €3bn for Bayer and $2.3bn for J&J last year. For years it led the market among NOAC drugs, keeping ahead of Pfizer and Bristol-Myers Squibb’s Eliquis (apixaban) and with Boehringer Ingelheim’s Pradaxa (dabigatran) and Daiichi Sankyo’s Savaysa (edoxaban) some way behind in third and fourth place, respectively. This year saw a reversal of fortune however, with Eliquis overtaking it with a commanding 50% increase in sales to $2.3bn in the first six months of the year, according to BMS. The overall NOAC market is growing strongly in the face of a string of new studies showing the new drugs' benefits over older anticoagulants such as warfarin, but Xarelto has seen its market share erode dramatically as Eliquis has advanced. Bayer and J&J have been working hard to generate data to support its franchise. Earlier this year, the results of the EINSTEIN CHOICE trial found that Xarelto was more effective than aspirin at preventing recurrent blood clots, with no increase in bleeding risk in patients with venous thromboembolism (VTE), but a secondary stroke prevention indication would have represented a greater opportunity. “We are committed to continuing the extensive investigation of rivaroxaban for patients at risk of deadly blood clots,” he added. On the plus side, Bayer and J&J reported positive results from the COMPASS trial which showed that the combination of Xarelto and aspirin significantly reduced cardiovascular death, stroke, or myocardial infarction compared to aspirin alone in patients with stable atherosclerotic vascular disease. Analysts have suggested that could add $1.5bn to Xarelto’s sales potential, and the two companies have said they intend to file for approval in this setting before the end of this year.